Sesamoiditis is a condition in which the sesamoid bones in the forefoot and their surrounding tissues become inflamed. This condition is often caused from overuse or repeated trauma to the foot. Sesamoid bones are bones that are not connected to other bones but are located in tendons or muscle. Athletes such as runners, baseball and football players, and dancers are likely to experience sesamoiditis. Those with high arched feet, flat feet, or runners who run on the ball of their foot are also prone to suffer from sesamoiditis. Treatment for sesamoiditis is generally mild and includes rest, anti-inflammatory and pain medication, and ice treatments to deal with the swelling and pain. 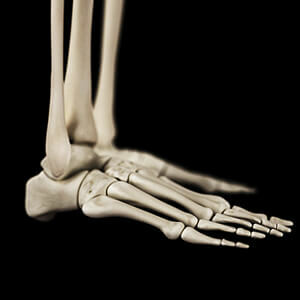 Orthotics may be needed for people who have flat or high arched feet to relieve pressure off the bones. In some cases, the toe will be taped and immobilized to allow healing. The podiatrist may also decide to use a steroid injection to help with swelling as well. If you have sesamoiditis, you shouldn’t engage in any intensive activity, as it may inflame the area and worsen your pain. If the sesamoid bone has fractured, surgery may be required to remove the sesamoid bone. If you are suffering from sesamoiditis or are experiencing symptoms similar to sesamoiditis, you should stop all physical activity that puts strain on the area. Contact us today to learn more about proper treatment!